Seton's Tag Holders are backed by our 100% Satisfaction Guarantee! Select from a wide variety of Tag Holders at competitive prices. Plus most of our top-quality Tag Holders are in stock and ready to ship today. Adhesive-back vinyl label protector keeps your tags lasting longer. Hanging zip-lock vinyl label protector keeps your tags lasting longer. Hanging vinyl label protector keeps your tags lasting longer. Protect your important work documents from being lost or ruined. These heavy-duty hanging protective holders have bound and sewn edges that prevent holders from tearing. 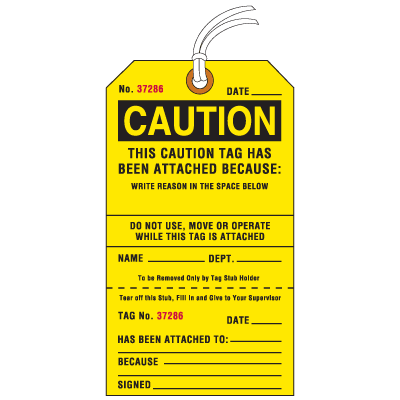 Caution jumbo tear-off tags notify employees of hazards and impending repairs.